If your lawn starts to look yellowed or bare, you may need the help of our amazing range of grass greening products. 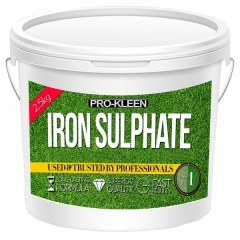 Our iron sulphate is available as both a powder and a liquid solution for your convenience. 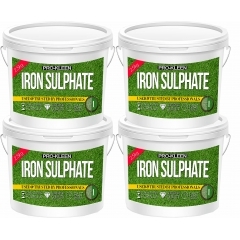 Iron sulphate is an essential nutrient that helps keep your lawn healthy, ensuring it grows softer, looks greener, and fights off disease more effectively. Just spread a dose over your lawn every few months and water it down for a lush lawn that stays green all year round. A healthy lawn is better at fighting off lawn disease, cold snaps, and pests, meaning a dose of iron sulphate is the perfect way to avoid those barren patches of dirt appearing on your lawn. Moss isn’t just unsightly when it appears on your lawn – it competes with your grass for light and water, and can kill off whole patches of your lawn. 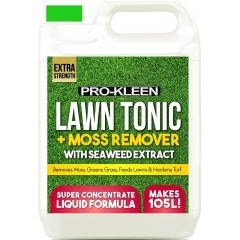 Iron sulphate blackens moss, allowing you to simply rake it away, leaving you with a healthy lawn that’s lush, green, and moss-free.